FOR_3: To forecast or not to forecast? Prepare a clear description of previously performed steps for facilitating the assessment of alternatives. To check consistency of the developed results. All members of the working team should agree on the consolidated results. Summarize the results of the preceding Step 2 and Step 3. Reduce the number of alternative technologies for further analysis in order to keep the set of alternatives operational and to preserve the efficiency of the forecasting project. Compare the collected alternative technologies with respect to the selected performance characteristics. In accordance with the main function of STFSTF = System to be forecasted , identify the most essential performance characteristics for the expected upcoming changes in the super-system. 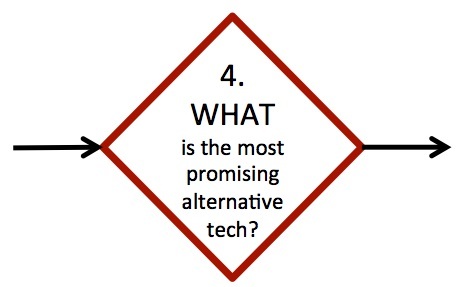 Discuss and extract a small number (e.g., 2-3) of the most promising alternative technologies. Identify the problems and limitations characterizing the alternative technologies of the STFSTF = System to be forecasted , by focusing on the most promising selected ones. ➔ As mentioned in Step 2 of Stage M Add a Tooltip Text, studying alternative systems essentially aims at collecting problems-limitations about STFSTF = System to be forecasted and its contexts. Therefore the selected alternative technologies should be representative rather than numerous. ➔ Number of alternative technologies can be reduced by cutting inappropriate ones or by clustering several technologies into one. ➔ Performance characteristics, identified in M Add a Tooltip Text Step 3 are used as a guideline to reduce number of alternatives. ➔ Based on the most important performance characteristics, the most promising technology compared to the current technology may even be costlier than the current technology. ➔ Most promising technology might be more harmonized to future changes in super-systems. ➔ On the one hand, it is necessary to limit the number of alternative technologies in order to ensure the feasibility of the forecasting project; on the other hand, it is necessary to keep the most relevant problems and limitations within the scope of the study. Therefore, cutting out some less promising alternative technologies involves the risk of neglecting some potentially meaningful aspects. This should be taken into account at the end of the study when the TF is validated and the overall limitations of the study are made explicit. ➔ If you have already organized data about the characteristic performances and expenses of the STF with the logic of the System Operator, use them to get fact-based support in the selection of the most promising alternative. Indeed, with data organized on a time perspective, it might emerge that an alternative technology that today is properly working has a relative small growth margin in the future. This could be because of a long history of improvements or, vice versa, something that is not yet working, as needed, might grow rapidly for novel developments of some of its parts or favourable context conditions. While analysing technologies for the decoration of plastic parts for household appliances, six alternative systems were identified as relevant: silk printing, pad printing, hot stamping, laser marking, chemical etching and inkjet printing. All recognised performance factors were grouped into six performance characteristics. For every alternative technology the score was calculated for each performance characteristics. The total score was calculated for every alternative technology. See short version of evaluation matrix below. After performing the functional analysis and recognizing the resources involved, the domain experts identified the following performance characteristics as the most representative for decision making: controllability of printing process (more control on image), flexibility, productivity of process (pcs/h), maintainability (non-working, h), Integration level with production line and price of machine (EUR). The alternative technologies were then compared with respect to the performance characteristics. Controllability of printing process, Flexibility and Integration level with production line were identified as the most vital performance characteristics for coming changes in super-systems. From the above list, one of the most promising alternative technology is inkjet printing, since it shows the best score for flexibility and integration level with production line and an adequate score for productivity of process. Chemical etching and laser marking are second and third promising alternative technologies consequently.